To celebrate the 500th birthday of the formidable Catherine de’ Medici, we will be posting seven articles over the next seven days about her. This is the third, and it will focus on the rivalry with her husband’s mistress Diane de Poitiers. 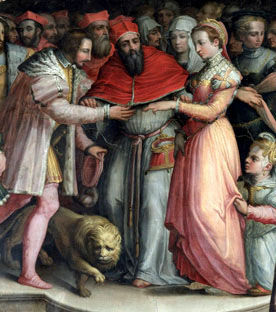 Catherine de’ Medici, the niece of Pope Clement VII, was married to Henry II, King of France. The pair married in October 1533 when Henry was second in line to the French throne, Henry and Catherine were both fourteen at the time. The couple’s marriage was consummated immediately, but following this, the couple did not see much of each other in the following years as Henry was often away on campaign. Catherine was devoted to her husband, but Henry showed little interest in his wife and is remembered for his infidelities. The most famous mistress was Diane de Poitiers. Henry and Diane had met when Henry was a young teen and King Francis I had asked her to tutor the shy boy, nothing happened romantically between the pair at this stage. When Henry was nineteen, however, he returned from war and was reunited with the thirty-eight-year-old Diane. It was around this time Henry, now Dauphin of France, fell for the beautiful widow Diane. Henry continued to take other lovers, but none as important to him as Diane. For Catherine, Henry’s devotion to Diane was heartbreaking and also embarrassing. 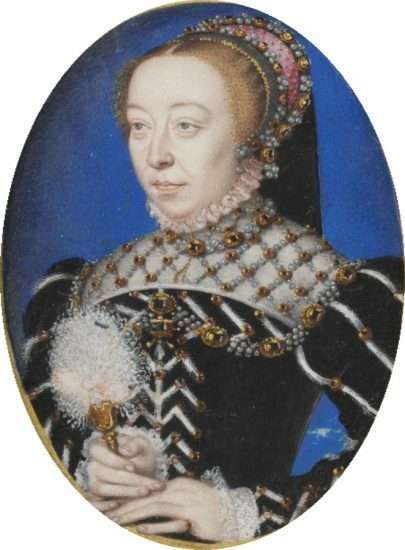 Catherine was still childless at this stage, her uncle the pope had died, and her reputation at French Court was failing fast. During this time, there were even plans to have Henry and Catherine divorced in order to replace her with a bride who could provide an heir for France. While Catherine watched her world crumble, Henry openly flaunted Diane to the court; he showered her with gifts and began to wear her colours of black and white as well as her emblem the crescent moon. He even went as far as creating monograms of his and Diane’s initials intertwined which were displayed on everything from personal items to buildings and can still be seen today. At this time, the strangest thing happened, and Catherine and Diane became allies. The rumours of a potential divorce between Henry and Catherine were obviously devastating to Catherine, but for Diane, a divorce between her lover and his wife could also be catastrophic. Diane knew where she stood with Catherine, she had control of Henry, and their relationship was under no threat. Diane was terrified of the prospect of a new, young, beautiful bride coming into the equation, who may have the power to usurp her as Henry’s beloved. Because of this, Diane began to fight Catherine’s corner by convincing Henry to stay with her and refuse a divorce. Diane spoke to Henry in private and began to talk about all of Catherine’s good qualities; she promoted her youth, her gentle and good nature and also said that Henry should not listen to his father who was trying to manipulate him. The stubborn young prince, he did not want to be seen as under his father’s control and so decided to work at his marriage with Catherine. Finally, after Catherine sobbed at her father-in-law’s feet any idea of divorce was called off, and Catherine was finally back in favour at court and received respect and affection from her husband all thanks to her rival Diane. Catherine threw herself into trying to provide a child to continue the line of France from this point onwards; she tried all medications and elixirs and was in constant prayer. Diane helped where she could; she provided potions and encouraged the Dauphin and Dauphine to read texts by ancient physicians and mystics. Catherine was forever ingesting and covering herself in a bizarre mixture of potions and poultices; she would do anything to bear a child, and this included covering her genitalia in dressings made of crushed antlers and dung or drinking mule’s urine. The poor Dauphine was driving herself mad by this stage, and she and Diane tried every remedy to make sure she fell pregnant. Catherine finally decided she needed to see how her husband and Diane made love and had holes driven through the floors of her chambers so she could spy on them; following this and a consultation with another physician Catherine was finally blessed with a pregnancy in 1543 after ten years of marriage. On 19th January 1544, Catherine bore a son and finally secured her position at the French court. Over the following twelve years, Catherine and Henry had nine more children who secured the French line. Over this time Catherine became an essential and celebrated member of the French royal family. Despite Catherine’s success in childbearing, Diane was still present in their lives, and Catherine had to learn to live with the fact she may always be involved in their marriage and even in the raising of her children in the royal nursery. By 1547, Henry and Catherine were King and Queen of France. Catherine may have believed at this point she would be finally in charge of her household and able to remove any rivals such as Diane. This did not happen, however, and Diane’s power grew as her lover became king. Diane accumulated great wealth and power during this period despite her advancing age and decreasing looks. Diane often eclipsed Catherine when it came to politics and helping Henry to reign over France and Catherine was resigned to a role of childbearing until her sons were older. 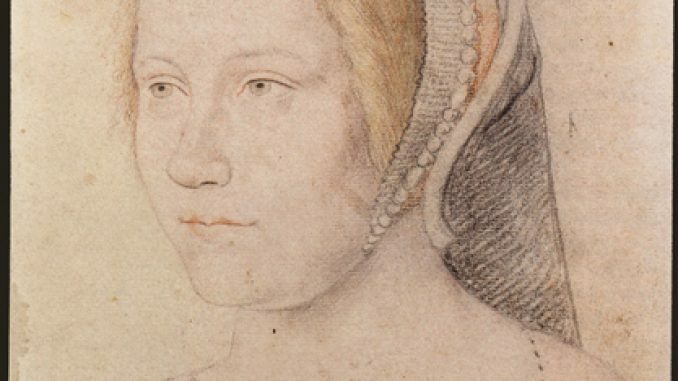 To the French public, it seemed that Henry and Catherine were a strong, loving couple and the nature of his relationship with Diane was only truly known in courtly society as the scandal could damage his early reign. While Henry lived, Catherine could do nothing to rival Diane’s power; Diane was given properties, wealth and titles eventually being bestowed the title of the Duchesse d’Étampes which once belonged to King Francis I chief mistress. Catherine tried her best to bear Diane’s presence in their marriage but sometimes Henry took things too far, and Catherine was hurt, for example when Henry entrusted Diane with the crown jewels and then gave her the Château de Chenonceau which Catherine had wished to retain for her own use.